BC Lulea (Basketligan) confirmed in their roster 30-year old Swedish power forward Brice Massamba (208-111kg-88, college: UNLV). He is a dual citizen owning also DR Congolese passport. Massamba has played there for the last two seasons. He helped them to win the regular season and make it to the final. Massamba played 2 games in Basketball Champions League where he recorded just 1.5ppg and 3.5rpg last season. The list of the past achievements is quite long as among others he won Swedish Basketligan championship title in 2017. Massamba was also voted AfroBasket.com All-Tunisian League Import Player of the Year back in 2014. He was also a member of Swedish international program for some years. Massamba played for Swedish Senior National Team between 2006 and 2014 and previously for U20 National Team in 2007. He represented Sweden at the Qualifications to European Championships 2015 four years ago. His stats at that event were 6 games: 4.0ppg, 2.8rpg. Massamba is quite experienced player. Thanks to his pro career he managed to play on three different continents (Europe, Africa and of course North America) in five different countries. 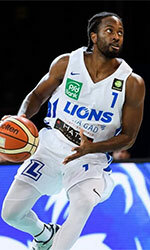 Massamba has played previously professionally in Croatia (Slavonski Brod), Denmark (Svendborg), Romania (CSU Sibiu), Sweden (Uppsala Basket and Talje Knights) and Tunisia (ES Sahel). He attended University of Nevada - Las Vegas until 2012 and it will be his seventh season as a professional player.